ORION! My absolute favorite constellation! See blog of 1/8/12, Orion- The Coming Prince. This is the most viewed blog I have written. The heavens declare the glory of the Lord (Ps 19:1) and this January constellation shows that the coming One is not a beast, but a triumphant, glorious Son of Man & Prince of Peace. I intend to brief you each month as to God’s original intent for each of the Heavenly ‘light holders‘ (ma’owr). The Constellations are ‘fixed stars’ and the planets are ‘wandering stars’. Almost every star has maintained the same Hebrew name that God gave them in the Beginning. Psalm 147:4 tells us that “He counts the number of the stars; He calls them all by name.” Each star has a part in the End Time plans of the Signs in the Heavens so it is a good idea to get familiar with God’s original intent for each star, whether fixed or wandering. The Planet Jupiter will be the highlight of January 2014, appearing larger than normal. 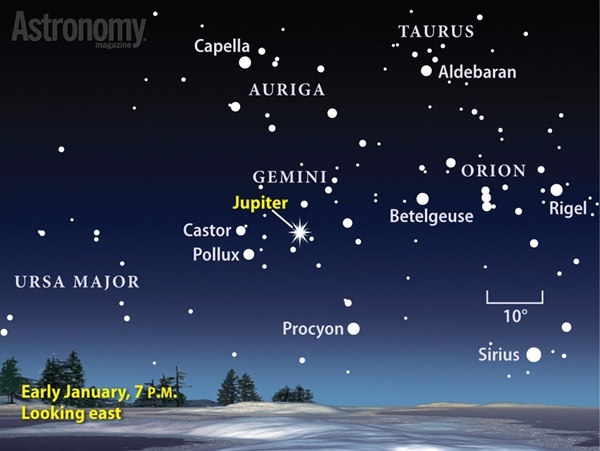 January 5, Jupiter will rise at sunset, and set at sunrise and visible all night long. The Hebrew name for Jupiter is Tzadik, which means righteousness. This planet is the King Planet, representing King David and the nation of Israel. I do not have any tips on how to get listed in Yahoo News. Sorry. seems a lot of it is popping it up all over the web without my authorization. Do you know any solutions to help stop content from being ripped off? I don’t have any copyrights on what I do. I have not had any issues and people appreciate the freedom to copy my audio material.